The Atlas is a large mountain that ranges from the Mediterranean Sea to gates of the desert. It stretches across 700 km in length and 150 - 200 km in width and is divided into several parts: the Middle Atlas, which extends from Fez to the region of Béni Mellal, the High Atlas, which separates the "green" Morocco from the presaharian Morrocco, extending from the desert plateau of Tavialet (region of Errachidia) to the atlantic ocean in the north of Agadir, where it touches the Anti Atlas, dry mountains which connect the region of Ouarzazate with the atlantic ocean in the south of Agadir. At last, the djebel Bani, which constitutes the last mountain barrier before the great saharian Hamada. These reliefs are rich in water and ascertain the supply of the southern areas. Many retaining barrages have been built to satisfy the expanding urban populations. 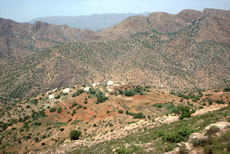 The Moroccan South is crossed by a large part of the High Atlas in east-west direction, which plunges in the Atlantic ocean in the north of Agadir and, more in the west, in N.E.-S.W direction, the Anti Atlas. 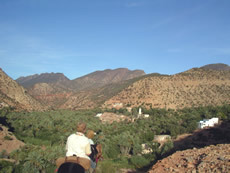 The highest crest in the Atlas mountains is the Toubkal (4165 m) south of Marrakesh. Sometimes the desert offers us a splendid view of the snowcapped crests.